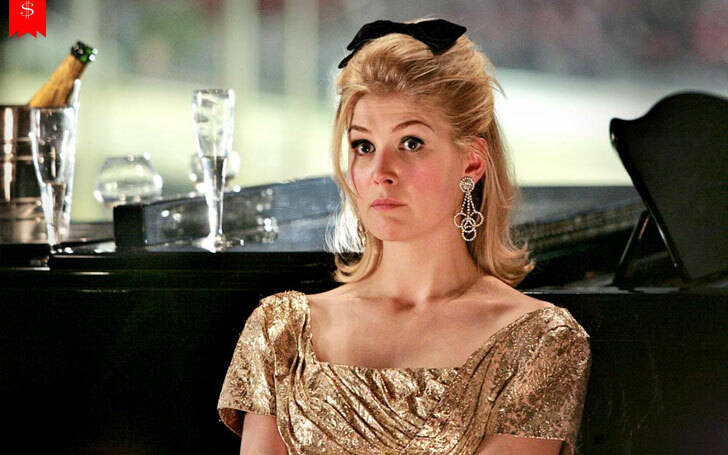 Rosamund Mary Ellen Pike, professionally known as Rosamund Pike, is an English actress, and she has an estimated net worth of $2 million as of 2018. She is best known for her portrayal of Amy Elliott Dunne in 2014 film Gone Girl. For the role, she did not only win numerous awards but also was nominated for the prestigious Academy Award. Born on 27th Jan 1979, the 39-year-old has been active in the industry since 1998. Moreover, as of 2018, she is all set to appear in four new movies. Her first movie which has already been released is Entebbe, also starring Daniel Brühl. As of 2018, Pike's net worth has been estimated to be $2 million. However, other sources like Celebrity Net Worth claims that her estimated net worth is $9 million. She is also estimated to have an annual salary of around $500,000. The actress is very low-profile when it comes to her earnings from films. There are no details about the sum she has earned from her appearances in movies and TV shows. So, here we have created a small list of box office earnings and budgets of some of her films. Her most recent film Entebbe has already made over $1.9 million nationally in just a few weeks. Similarly, some box office earnings from her other movies like Gone Girl, Wrath of the Titans, Doom and Surrogate are $168 million, $84 million, $28 million, and $38 million respectively. Acting is not the only source of income for the actress. Endorsement deals and sponsorships are also a considerable part of her income. Back in 2013, she collaborated with L.K. Bennett and designed a collection of handbags. She did not only designed the bags, but she also served as the face of the company's 2013 Autumn/Winter collection. We are sure that she received a hefty pay cheque for the collaboration as the bags were not only designed by her but also were gorgeous and had a price ranging from £350 (USD 495.65) to £495 (USD 700.98). Moreover, she has also been spotted sporting brands like H&M and promoting her friend Erdem's collection. Pike started acting and directing when she was a student at Oxford. It was not until 1998 she began her professional career. In the year, she appeared as a minor character in the TV series Seven Days. In the same year, she also appeared in TV film A Rather English Marriage. Even though she appeared in a few TV shows before graduating, she decided to quit acting after graduation as she did not get the opportunities. But in 2002, she was offered the role of Bond Girl Miranda Frost in James Bond's film Die Another Day. Marking her debut on the big screen, she also gained exposure and attention through the role making her a mainstream actress. In the following years, she appeared in numerous films, dropping more than two movies every year. Some of her well-known works on the big screen include An Education, Burning Palms, Jack Reacher, and many others. In 2005, she won her first award, a British Independent Film Award under the category of Best Supporting Actor / Actress for the portrayal of Elizabeth Malet in 2004 film The Libertine. Despite her third appearance on the big screen, her work was widely appreciated and applauded. However, the actress was not able to win another award until 2014. In the year, she won an Empire Award under the category of Best Actress for the portrayal of Amy Elliott Dunne in the film, Gone Girl. The role is one of her best-known works to date. She did not only win the award, but she was also nominated for some other prestigious awards. Moving on to her TV works, she has appeared in a few episodes of numerous shows like Foyle's War, Wives and Daughters and other but never has emerged as a leading character. As of 2018, fans can see her in four films. Her film Entebbe has already hit the cinemas and is doing quite good. Likewise, fans can also expect her in Beirut, also starring, Jon Hamm; Three Seconds, starring Joel Kinnaman and Ana de Armas; and A Private War, starring Jamie Dornan.